As regular readers know, in November I switched to Sony, replacing my 22 MP Canon 5D Mark III DSLR with the mirrorless 36 MP Sony a7R, plus three Sony lenses. My decision to switch had nothing to do with resolution and everything to do with the Sony’s image quality, dynamic range, and high ISO performance. Oh yeah, and the compactness of mirrorless. And after watching other DSLRs surpass the once upon a time state-of-the-art 5D Mark III, I just became tired of waiting through rumors. And when it finally came, Canon’s announcement of a 50 megapixel replacement for the 5D Mark III DSLR only validated my decision to abandon the company I’d been loyal to since the advent of my digital conversion, about a dozen years ago. Doubt that I don’t secretly covet the 50 megapixels of the new Canon 5DS? Well, last month I put my money where my mouth is and purchased a 12 MP Sony a7S (more expensive than the a7R). That’s right, 12 megapixels—a pixel count that has been in the rearview mirror of most DSLRs for about eight years. My a7R will remain my primary camera because it does everything I need it to do in most situations, and gives me extra resolution (I’m not opposed to more megapixels, I just don’t want them at the expense of the things I consider more important). In other words, if I can’t notice a difference, I’ll take as much resolution as I can get. But the best landscape images are often found in the most challenging light, so when the chips are down—like when I need extreme dynamic range or (especially) high ISO for low-light (moonless) night photography—I’ll turn to the a7S. What’s wrong with more megapixels? In digital photography, light enters through a lens, hits the sensor (which replaces the little rectangle of film we used to expose and develop), where it’s measured, digitized, and stored. Voila, a digital image is born. Looking closer, we see that a sensor is an array of microscopic electronic light-catchers called “photosites.” On any given sensor, not all photosites are created equal (each one measures a specific color, either red, green, or blue), but for simplicity sake, it’s enough to know that one photosite equals one pixel—that is, a 36 megapixel camera has 36 million photosites, and a 50 megapixel camera has 50 million photosites. A full-frame, 35mm DSLR has a fixed amount of sensor real estate upon which to place its photosites. Sensor technology continues to evolve, allowing more photosites and improved image quality with each sensor iteration, and spurring constant turnover as photographers chase the latest and greatest. But for any given technology, the fewer the photosites (lower megapixel number), the better the image quality. The only ways to add more photosites to a fixed sensor area are to shrink the photosites, and/or cram them closer. Simply put, a larger photosite collects more light than a smaller one, making it more efficient. Think of a bucket: the bigger the bucket, the more water it holds before overflowing. And the farther apart the photosites are, the better they dissipate (heat is the enemy of pretty much all things electronic) and the less they interfere with the surrounding photosites. There are advantages to a higher (mega)pixel count—larger prints, being the most cited benefit. A higher pixel count also increases the margin for error, allowing photographers to compose wide and crop later. But image quality is not one of those advantages, and in fact, the vast majority of photographers (including pros) don’t ever come close to needing the pixel count their cameras deliver. Pro photographers have already figured out the inverse relationship between megapixel count and image quality. Look no further than the $6,000 Canon and Nikon flagship pro bodies to see that pro photographers hopped off the resolution escalator long ago: Canon’s 1DX is 18 MP; Nikon’s D4s is 16 MP. Unfortunately, cameras are designed not for the expert minority, they’re designed for enthusiast majority. So until the consuming public figures out that they’ve been had, megapixels will continue to sell cameras, and camera manufactures will continue stuffing more onto our sensors. Last week I got a firsthand example of the joys of low-resolution photography…. I love night photography. While I’ve enjoyed and taught moonlight photography for many years, I’ve always been frustrated by the limitations of starlight (moonless) photography. Composition and focus are difficult at best in nearly total darkness, and getting adequate light into a moonless-night image usually requires unpalatable ISO and/or shutter speed compromises. But after hearing so many amazing things about the low light, high ISO performance of the 12 megapixel a7S, I just couldn’t resist (“Hi honey—uh, look what followed me home…”). Last week was my first opportunity to use the a7S beneath the stars, at a favorite Yosemite night spot beside the Merced River. Given that I was leading a workshop, this shoot was not about my photography—the priority that night was (in this order) 1) Make sure no one walks into the river, and 2) Help everyone get at least one successful night shot. Nevertheless, I did manage to squeeze in a few frames of my own. Bouncing back and forth between photographers in the dark, I occasionally stopped by my camera long enough to find a composition with the a7S and my Canon-mount 28 mm Zeiss F/2 (and the Metabones adapter). 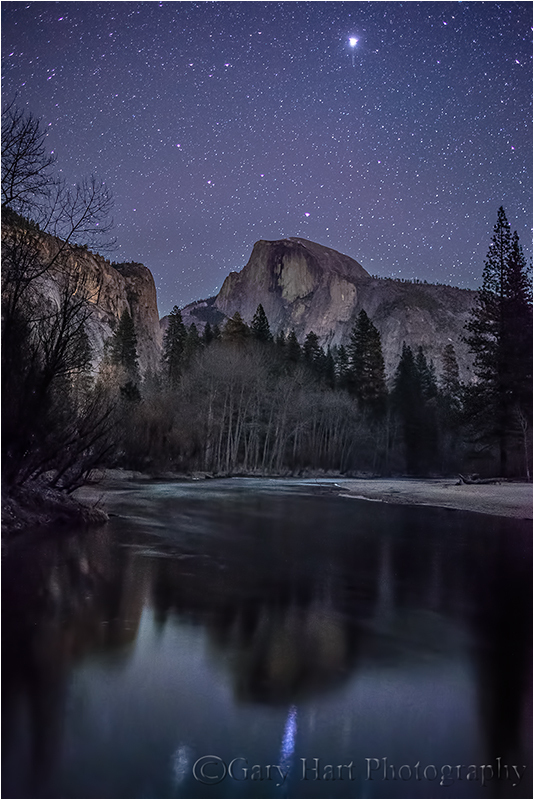 Jupiter was front-and-center, hovering above Half Dome, a focus gift for the group (finding focus in the dark can be a show-stopper for beginners). But rather than take the easy way out, I tried focusing on much less bright stars, just to see if it was possible. I’m thrilled to report no problem focusing on even moderately bright, magnitude 2 and 3 stars by centering one in my electronic viewfinder, magnifying the view to the maximum, and dialing the focus ring until the star shrunk a fine point. What had taken a minute or two of effort on my 5D III, including multiple exposures to verify sharpness, took about ten painless seconds on the a7S (it didn’t hurt to have an f2 lens—this might take a little more effort if your fastest lens is f2.8 or f4). Each time I visited my camera, I tried a different ISO/f-stop/shutter-speed combination. And while I’m not sure I got the most out of the a7S, I’m ecstatic about my results that night. I haven’t had time for extensive comparisons to determine the exposure combination that works best, but I learned enough to know that I’m going to love shooting with at night with the a7S. I’m sharing here an image from that night, one I just pulled up and processed quickly. At ISO 12,800 is it noise free? Absolutely not, not even close. But at an ISO I wouldn’t have dreamed of with my Canon bodies, I found the noise pretty manageable and the results more than acceptable. And to fully appreciate what you see here, you have to understand how completely dark it was out there—to pull out this much detail from so much darkness is nothing short of miraculous. Based on that one shoot, I think ISO 25,600 will be usable as well. I’m going to keep playing with it, trying to find the a7S’s ISO/F-stop/shutter-speed/noise-reduction sweet spot, over the next few months. I leave for Maui next week, but the moon will be in my night sky while I’m there. I’ll have have dark skies again at the South Rim of the Grand Canyon in mid-March, but the trip I’m really looking forward to is my Grand Canyon raft trip in May, when we’ll have no moon and some of the darkest skies on Earth. So stay tuned. Really like the information you share, thanks! Happy to help, Ralph. Thanks for reading! So just when I get the A7R you are now going to convince me by example I need the A7S, hmm. Wonderful photo, tonality range beyond belief, say no more. Sorry I have to bring this up, but doesn’t carrying around an A7R and an A7S, negate the volume and weight advantages of mirrorless over DSLRs? Also for years we have heard “all you need is 12MP to produce good images and prints”, yet no one (including the pros) takes that information to heart, it seems. I have seen so many seasoned nature photography pros switch over to 36MP, when just a few years ago all I heard and read was “there is no way we need anything more than a 20-something MP camera…it is more than enough to make professional images!” Is the song of the Siren of Megapixels, that strong that even pros cannot resist? It seems the pros are saying one doesn’t need a lot of MP, but then they turnaround and put a big MP camera on order….it is a case of “Do as I say, not as I do!”? I find the whole situation confusing. It’s about flexibility, Ben. No single camera, mirrorless or DSLR, comes close to doing what the a7R and a7S combo does. So now, in two bodies totaling the same weight as one 5D Mark III (and much less weight than one 1DS Mark III), I have what feels to me like more than double the imaging power I had before. To me, that choice is pretty much a no-brainer. Not only that, there’s no law that says I have to carry both bodies—when I go out at night, the a7R stays home; in the day, it’s the a7S that gets to rest. And if I might need both? I’m still carrying no more weight than I carried before, but with a huge upgrade in capability. So I just don’t see the downside. Regarding resolution, perhaps you didn’t read my entire post. The most expensive, flagship pro bodies from both Canon and Nikon are under 20 megapixels. But other than that, serious photographers don’t have any real low-resolution choice, so you can’t really say that pros are choosing high megapixels. Given a choice between high resolution and image quality (a choice we didn’t have at a reasonable price until the a7S), most knowledgeable photographers would opt for image quality. Sadly, the camera companies aren’t targeting expert minority, they’re targeting the enthusiast majority. Which was the whole point of my post. I have been watching with interest the many pros out there and have been awaiting for them to switch over to mirrorless, but it seems few have…you and Don are the first. As for me last year I had the choice when upgrading last year of either going mirrorless (Sony A7), or legacy DSLR design. After going back and forth for several months I decided to go with the legacy DSLR design as it seemed logical. As much as I wanted to jump to the leading edge with the A7, I thought, at least for me, that mirrorless isn’t quite there yet. You know your portfolio even being “hobbled” by the legacy Canon DSLR, still has produced great imagery. At this point in time, at which many cameras are good enough, the quality of the photography is in the imagination of the photographer, rather than the equipment they carry. You know even if you never upgraded to the Sony, you would still be turning out great photos, right? Thanks, Ben. I completely agree that too much emphasis in photography is placed on equipment and technology, and that all the great equipment and/or processing in the world won’t make someone a better photographer. But, paradoxically, better equipment makes better pictures, and serious photographers always want the equipment that best extends whatever limitations they’ve run up against. My obstacle was dynamic range and low light, something the Sony mirrorless system does much better than anything Canon offers. I don’t particularly care about the speed, bulk (not necessarily a bad thing), and lens selection of a Canon or Nikon DSLR, but those things might be essential to another photographer. It’s interesting that you’ve missed the pros who are switching to mirrorless. I certainly wouldn’t have made the plunge without pros I know and respect going before me—my catalyst was hearing Michael Frye’s enthusiasm for the a7R (which he’s been using for about a year), then seeing firsthand the images Don was getting shooting the same scenes with his a7R that I was shooting with my Canon. And if you want more examples, look no further than the Sony Artisans site: http://www.sonydigitalimaging.com/artisans/. Chasing the “latest and greatest” is a fool’s errand, and hand-wringing about someone else’s equipment choice is a waste of energy. I won’t tell anyone what camera system is “best”—all you’ll hear from me is what’s best for me, and why. No regrets so far, but your results may vary. Thanks for the information and well-reasoned argument for both 12MP and 36MP resolution applications. I switched from the D800 to the D810 because of the improvements in handling and deletion of the AA filter. I love using that camera, but will likely move to the A7r in the next year, like we discussed over coffee in Natomas. The weight and IQ of the Sony are both pretty persuasive, particularly when you consider the total weight of the aggregate of body and lenses carried in a backpack on an aging back. Now, you’ve thrown another variable in my equation with the A7s, since I love to shoot in the dark, too. Maybe I’ll try to persuade Kathi to get the 7s and I’ll get the 7r. I can’t wait to see what the A7s does for your Kīlauea caldera shots. My pleasure, Mike. You might want to consider sticking with the D810 and adding an a7S (though I don’t know if the Nikon lenses play as well with Sony/Metabones and the Canon lenses do). One thought I had while reading your metadata was you opinion about using your legacy Canon lenses vs. those from Sony. It seems that, depending on the legacy lens, those designed for the full-frame body would be much heavier than the Sony or Zeiss lenses and reduce the weight advantage you gain by going mirrorless. I think that would be especially true if you used a telephoto with on a mirrorless body. Thanks for your comment, Mike. Even though it’s mirrorless, my Sony a7R is also a full frame body. I’ve switched all of my primary lenses to Sony, but a few of my specialty lenses remain Canon. While the Sony lenses are slightly smaller than their Canon counterpart, the size of the sensor determines the size of the lenses than the size of the body does. If you want significantly smaller lenses, you need an APS-C or 4/3 system (at the cost of some image quality that may or may not be significant, depending on your needs). Do you think you would ever give something like this a try? I would like to see what the A7s could do with that fast f stop. The faster the better for night photography, Jeff. I wouldn’t buy a lens simply because it’s fast, but I’d sure take a good look at it if the reports are good. Hello, Gary! It’s been a long time but I always enjoy your monthly reports. Thank you for keeping me in your viewfinder. Besides the MP count, the lens is the critical factor affecting image quality. Unless I’m wrong, very few commercial lenses are capable of getting the added resolution benefit from any sensor over 10 MP. Without better glass the I don’t believe the higher MP count does much to improve the image quality. This should be taken into account by the enthusiast majority and it’s the reason I’m still happy with a 12 MP D300. I’ll be in another of your ‘shops sometime! Thanks, Andy, it’s great to hear from you. There’s definitely validity to the theory that sensors out-resolve their optics, but I think the threshold is higher than 10 MP for the best glass. But the D300 is still a great camera and it sounds like you don’t need the extra resolution—if you’re missing anything, it’s probably the low light and high dynamic range capabilities of the current sensors, but there’s no sense putting money into a new body until you’re ready. The longer you can wait, the better the technology will be when you finally pull the trigger.